GAO-16-382: Published: Jun 2, 2016. Publicly Released: Jun 2, 2016. GAO reviews how the federal government manages Midway. To see high-resolution photographs from this report, please see GAO’s Flickr page. According to officials in the Department of the Interior's U.S. Fish and Wildlife Service (FWS), operations funding for Midway Atoll (Midway) has decreased in recent years and project-specific funding has varied. Specifically, budget officials said that FWS, after increasing the funding allocated to Midway's operations to more than $4 million by fiscal year 2011, decreased Midway's allocation by more than $1 million by fiscal years 2012 and 2013. These officials said that the lower allocation led to suspension of public visitation on Midway in November 2012, which, in turn, decreased operations funding available from fees collected for services such as lodging. Midway has also received funding for specific projects, such as lead-based paint abatement. In addition, under an interagency agreement, the Federal Aviation Administration (FAA) has reimbursed FWS up to $3 million per year for the direct costs of operating Midway's Henderson Airfield and provided additional funds for capital improvement projects, such as resurfacing runways. FWS has maintained most historic properties on Midway but has demolished others without providing for public notice and involvement, which is not consistent with the regulations implementing section 106 of the National Historic Preservation Act. A 2000 order by the Secretary of the Interior directs FWS to administer Midway in accordance with the law. Federal agencies must provide the public with notice of and opportunity to comment on agency actions that may affect historic properties. Since 2012, FWS has demolished seven historic properties on Midway as part of the agency's removal of lead-based paint and taken another action adversely affecting historic properties without providing adequate public notification, including directly notifying parties that have previously expressed interest in historic preservation issues on Midway, and an opportunity for public comment. An FWS official said that the extent of such notification may vary based on the size of the actions. However, officials with the Advisory Council on Historic Preservation said that groups known to have a high level of interest should be notified directly. Without providing public notification, including ensuring that such parties are notified about future actions that may adversely affect historic properties, FWS will not have reasonable assurance that it is adequately seeking public comment and input under the section 106 process. Since the suspension of public visitation to Midway in 2012, FWS faces multiple challenges relating to personnel, infrastructure, supplies, and transportation access to reestablish the program. For example, the building used to house visitors is almost beyond the point of repair and renovation, according to a 2009 assessment of its condition. FWS officials estimated that $1.2 million in annual funding would be needed to reestablish a public visitation program and that additional funding would also be needed for start-up costs. Midway's Henderson Airfield serves as an emergency landing airport for aircraft in the mid-Pacific Ocean region and facilitates access to Midway and its surroundings. Under FAA regulations, air carriers must designate in their flight plans a certified airport for use in the event of an emergency during extended operations. Since 2003, there have been seven military and civilian emergency landings on Midway. 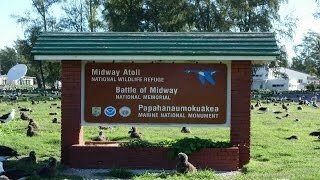 Midway, a trio of islands about 1,300 miles from Honolulu, has been managed by FWS as a wildlife refuge since the closure of a naval base in 1996. Midway also serves as a national memorial to a historic World War II battle. GAO was asked to review FWS's management of Midway. This report examines (1) funding for operations and projects on Midway for fiscal years 2009 to 2015, (2) how FWS maintained historic properties on Midway and the extent to which it consulted with key parties and sought public comment, (3) challenges FWS faces in reestablishing a public visitation program, and (4) the use of Midway's Henderson Airfield. GAO visited Midway in April 2015 to observe the condition of historic and other properties. GAO reviewed budget data for Midway from fiscal years 2009 through 2015; reviewed laws, policies, and regulations on historic preservation; examined public visitation plans, emergency landing data, and the use of the airfield; and interviewed FWS, FAA, and Advisory Council on Historic Preservation officials and other stakeholders. GAO recommends that FWS ensure that the public, including previously interested key parties, are notified about FWS actions on Midway that may have an adverse effect on historic properties. The Department of the Interior agreed with GAO's recommendation. View a video of GAO's review of FWS's management of Midway. To view high-resolution photographs from this report, please see GAO's Flickr page. Comments: As of September 2018, the Department of the Interior's U.S. Fish and Wildlife Service (FWS) has developed a database of historic resources to track its correspondence with key parties that have previously expressed an interest in historic preservation issues on Midway, among other things. FWS has undertaken a number of projects on Midway that have the potential to have an adverse effect on historic properties. FWS corresponded with interested parties requesting their input and comment on those projects. GAO will continue to monitor whether FWS develops a method of seeking public comment and input. Recommendation: To fulfill the secretarial order's directive that FWS manage Midway in accordance with the National Historic Preservation Act, the Secretary of the Interior should direct the Director of the U.S. Fish and Wildlife Service to ensure that the public, including key parties that have previously expressed interest in historic preservation issues on Midway, are notified about future FWS undertakings that may have an adverse effect on historic properties so that they have an opportunity to provide comment and input.